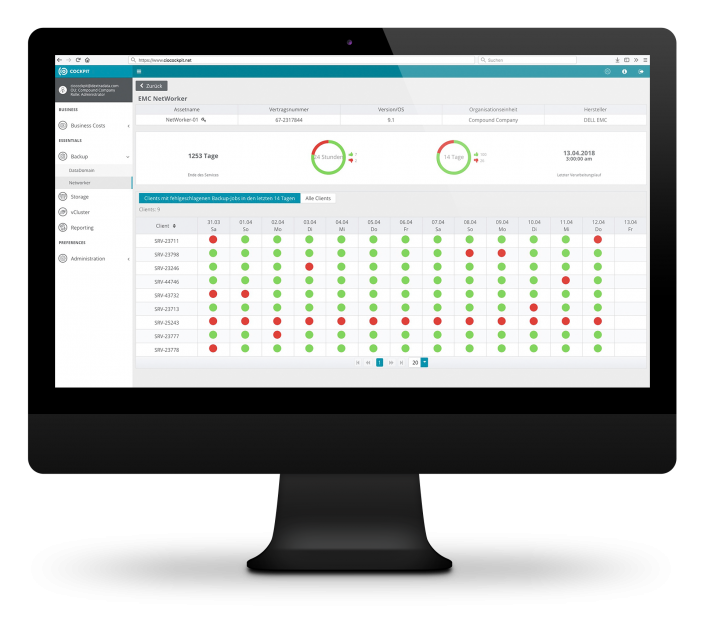 The CIO Cockpit Essentials solution helps IT operations managers to get a fast overview of your entire IT environment by providing relevant KPIs of all assets at a glance. Predefined views help you to visualize the data which is collected from different systems so that anomalies and significant changes are detected immediately and appropriate measures can be taken. Whether you want to generate a CIO report, a management summary or a detailed documentation you’ll find all of them predefined and standardized in PDF format in CIO Cockpit Essentials. 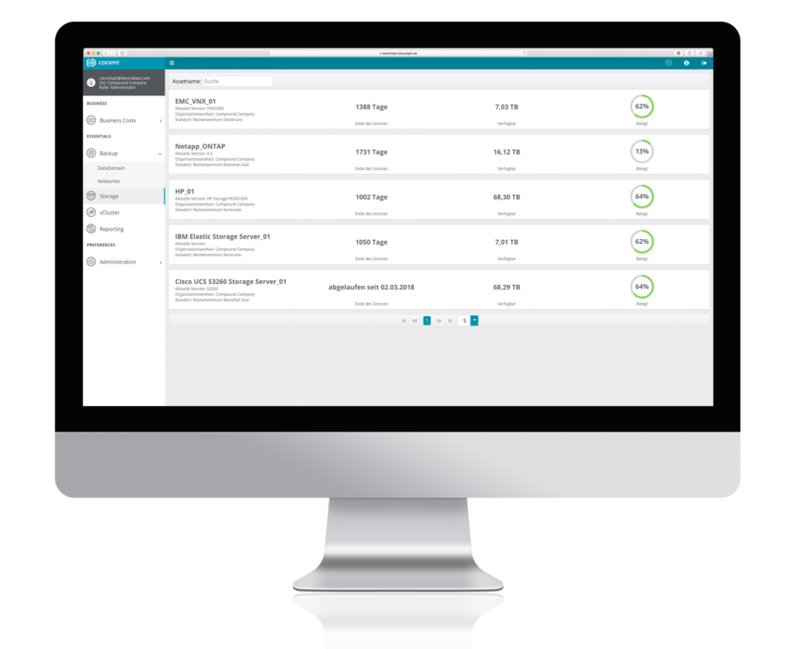 With CIO Cockpit Essentials you will manage to establish the needed transparency for a cost-effective use and an optimization of your IT environment. In just one view you can see the status of all your systems of one asset group (Storage, Backup, Hypervisor etc.) throughout all manufacturers and with standardized KPIs. Profit from more transparency in overviews, more measurability and easier comparability as well as detailed information of the individual systems. Detect anomalies and find their cause by yourself! Facts about performance development of an asset, deduplication rates, utilization and thresholds (Storage, vCluster, DataDomain) will enable you to no longer rely on external help. Moreover you will have summarized visualization of all data about location, serial number and name of the system as well as commercial data like depreciation, acquisition and installation costs for every individual asset. Identify all successful resp. failed backups on a daily basis or get a weekly overview. Use this information for the optimization of your IT environment and for well-founded resource and budget planning. CIO Cockpit Essentials is designed in a way which allows us to capture all assets even in heterogeneous or historically grown IT environments so that we can provide you with standardized KPIs across your entire IT. Currently we support all common systems of the market-leading manufacturers like Dell EMC, IBM, NetApp (and many others). You are using assets which aren’t listed in this table? Contact us! Thanks to our agile development strategy there are (almost) no limits when it comes to enhancing our solution and supporting highly complex environments. The current status of the information displayed in CIO Cockpit can be exported any time in clear, predefined PDF templates. The analyses can therefore be shared easily even with colleagues who don’t have direct access to CIO Cockpit and can be forwarded within the company. This simplifies reporting, provides up-to-date information and ensures the required documentation in companies, which archive paper copies for compliance reasons. The Technical Detail Report consists of the technical and commercial information for each asset. You can select asset type, location or detailed information of the respective assets. How detailed you design the report is entirely up to you and can be adapted immediately depending on the needs of the addressee. This saves time and increases readability for the respective target group. In the Timeline Report you can set information from the technical report in relation to time. Create views for a particular asset type, a concrete location or choose detailed information of a specific asset in order to see its development over time.